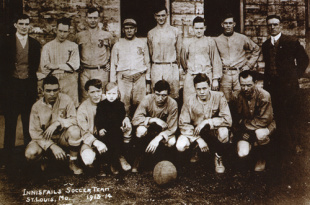 When, a year after it had won the American Cup, Tacony FC traveled to St. Louis in 1911, they came back from two goals down to draw 4–4 with St. Louis champion St. Leos in what newspapers called a “blue ribbon” match to decide the “national championship.” With the draw, talk of a national champion ended. But the very next day, Tacony lost 3–1 to Innisfails, the second best team in St. Louis, in what was only the third defeat suffered by the Philadelphia team in two years. An unprepared Tacony squandered the opportunity to prove its superiority over St. Leos when that team toured the East Coast in March of 1912, losing 2–1 in the first game of the tour. But the trip east soon proved to be a disappointment for St. Leos. The win in Philadelphia was the only victory of the tour and the visitors returned to St. Louis with a 1–3–1 record, including a humiliating 7–1 loss to American Cup holders, Howard & Bullough. In March of 1913, Tacony would have a chance to avenge its loss in St. Louis when Innisfails embarked on an East Coast tour of their own. But before that, two East Coast teams would travel west to try their luck in the Mound City. Harrison, New Jersey’s West Hudson AA won the 1912 American Cup, defeating Paterson Rangers 1–0. On Dec. 6, 1912, the Philadelphia Inquirer reported that the Hudsons had agreed to play in St. Louis for a guarantee of $1500 (just under $35,000 in today’s rates) “with a bonus of ten percent of the profits from the games after the expenses have been deducted.” Fourteen players would make the trip over the Christmas holiday and the Inquirer reported “the eleven will be made up as near as possible of the players who were with the West Hudsons when the club captured the championship last season.” More to the point, William Dooling, the secretary of the St. Louis League, requested “that the Harrison eleven take to St. Louis the players who registered a 3 to 2 victory over the Western team last spring” during St. Leos’ East Coast tour. Before they met St. Leos, West Hudson played Innisfails on Christmas Day in front of some 5,000 spectators. The Inquirer reported on Dec. 26 those spectators saw “the Eastern speed marvels…big husky, husky warriors who are fast withal and can kick and pass to beat the band” defeat the home team 4–1. West Hudson next faced Business Men’s AC on Dec. 28 in a rough match that ended in a 1–1 draw. The following day the visitors finally faced St. Leos at St. Louis’ Sportsmen’s Park. As the Inquirer reported on Dec. 30, “The hard game of the day before had evidently slowed up the West Hudsons somewhat, as they failed to show as much dash and speed as in the contest with the Innisfails on Christmas afternoon.” St. Leos showed “some very pretty teamwork and fooled the visitors often by their dribbling and passing.” Scoring three goals in the course of five minutes in the first half, St. Leos won the match 4–2. Howard & Bullough, who had thrashed St. Leos 7–1 during their East Coast tour in March, visited St. Louis for three games only days after the West Hudsons over the New Year holiday. They lost every game, including 4–1 hiding from Innisfails on New Years Day, with St. Leos exacting revenge in a 5–1 win over the Rhode Island team. The Inquirer reported on Feb. 2 that arrangements had been completed for another St. Leos tour of the East that would include games against Tacony, West Hudsons, Fall River Rovers, Howard & Bullough, and Jersey AC. As it turned out, Innisfails would be the St. Louis team to make the trip. A match between the two St. Louis teams on Jan. 19 in league play had ended in a massive pitch invasion. With one Innisfails player already ejected in the first half for fighting, another fight broke out between the Innisfails keeper and a St. Leos’ forward with ten minutes left to play and St. Leos winning 3–2. Police, and many of the 2,700 spectators, poured onto the field and the game was abandoned. St. Leos claimed that the victory (and, therefore, 60 percent of the gate receipts) was theirs but the league ignored their claim. When St. Leos quit the league in protest, they were replaced by another team. The Innisfails tour—arranged with the help of the American Football Association, organizers of the American Cup tournament and at the time the governing body of the soccer in the US—would include matches against Philadelphia Hibernian, West Hudson, Tacony, Fall River Rovers and Paterson True Blues. The tour would begin in Philadelphia against Hibernian on Easter Saturday, March 22, and was scheduled to include an incredible six games in nine days. The touring team would be made up of 11 Innisfails regulars plus “three star players” from other St. Louis teams. 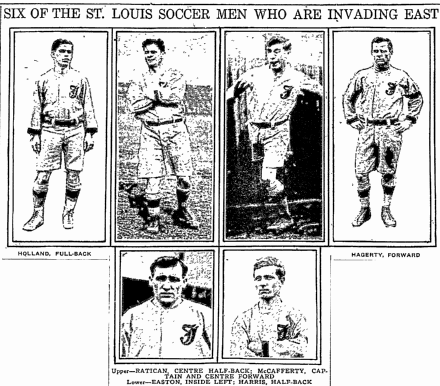 As the Inquirer noted on March 22, “While the club represents one of the leading Irish organizations [in St. Louis], it is, with three exceptions, composed of American-born players.” In contrast, the teams they would be facing on the East Coast were largely made up of immigrant English, Irish and Scottish players. The week before Innisfails was due to play Hibernian, Tacony and Hibs met in the American Cup semifinal at Tacony Ballpark. Tacony had won the Cup in 1910 and made it to the semifinals the following year before being knocked out by Howard & Bullough, who themselves defeated Hibernian in the 1911 final. In 1913, Hibernian was the favorite to win the Cup. 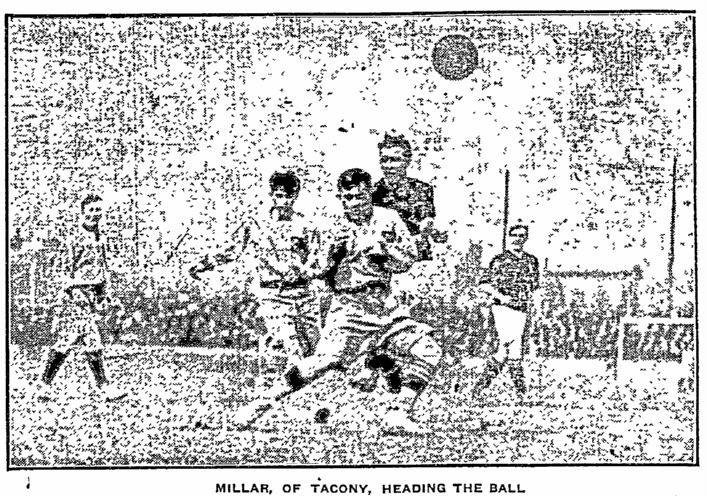 The Inquirer reported on March 16, 1913, that Tacony “has not been very conspicuous this season,” while Hibernian were considered “the one best bet to cop the Cup this season,” being the reigning champions of the Pennsylvania League. But when the two clubs met on March 15, Tacony prevailed, winning 2–1, aided by the inclusion of three players from the Philadelphia Electrics and Pennsylvania and Reading Railroad AA clubs from the city’s American League in the side. McNichol equalized for Hibs ten minutes into the second half off of “a splendid cross” from outside left Tommy Gaynor, “the Innisfails keeper making a mess of the cross, and should have prevented the center forward from scoring.” From there, the home team dominated the half. The Inquirer reported, “There was no mistaking the superiority of the Hibernians toward the later part of the game, for though they did not prove the cleverer combination, they made up for what they lacked in that respect by their doggedness, especially in the final minutes.” Despite this dominance, the Innisfails defense held and the match ended as a 1–1 draw. On a frigid and windy Easter Sunday the very next day, Innisfails played West Hudsons at Harrison Oval in front of some 2,000 spectators who had “braved the raw air which was all against witnessing the game from a spectator’s standpoint.” While the visitors struggled at first to get started, the Hudsons scored two goals in the first nine minutes of play, one coming from a penalty kick after a handball in the penalty area. Innisfails returned by train to Philadelphia that night to play Tacony the next day in what would be their third game in as many days. On March 24, the same day that the Inquirer announced the news that the 1913 American Cup final between Tacony and Patterson True Blues would be played in Philadelphia, Tacony played Innisfails at Tacony Ballpark at State and Unruh Street. 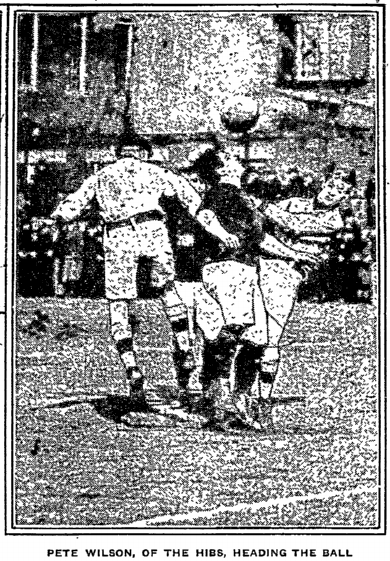 It was in a rare Monday game for Philadelphia soccer at the time, perhaps made possible by the Easter holiday. The scoring wasn’t over. “Hardly had the ball been placed in the center of the field when Bobby Morrison, who was acting captain, passed to Millar, and the latter feeding Andrews at the psychological moment, the latter tallied his second and final goal for Tacony” to make it 4–0. Five minutes from time, Innisfails scored a consolation goal but the match ended as their first loss of the tour. The Innisfails tour was to have continued on Wednesday, March 26 in the first of two games against Fall River Rovers in Massachusetts, but that game was cancelled due to rain. The two teams met on March 29 and, after a scoreless first half, Innisfails scored five minutes into the second half only to concede an equalizer 20 minutes later and the match ended in a 1–1 draw. On March 30 they played their final game of the tour against Patterson True Blues. It was a wild contest, with the St. Louis team scoring four goals in the first half. But the True Blues scored three goals of their own in the first half, and a fourth in the second, to finish with a 4–4 draw. Filled with confidence when they arrived in Philadelphia on March 21, Innisfails returned to St. Louis winless with a 0–1–4 record. While they may have been consoled by the fact that their East Coast tour record was better than that of St. Leos, their rivals back in St. Louis, it is hard to imagine that anyone could have realistically expected the tours of either team to end favorably given the number of games crammed into such a short period. In the end, such an expectation was just as absurd as the belief that a one-off game could truly determine national champion. For Tacony, the 1913 American Cup final remained to be played against Paterson True Blues, who had defeated Fall River Rovers 3–0 in the semifinals the same day that Tacony topped Hibernian. Little did the finalists know that they were about to embark on an epic contest that would require two replays to declare a champion.